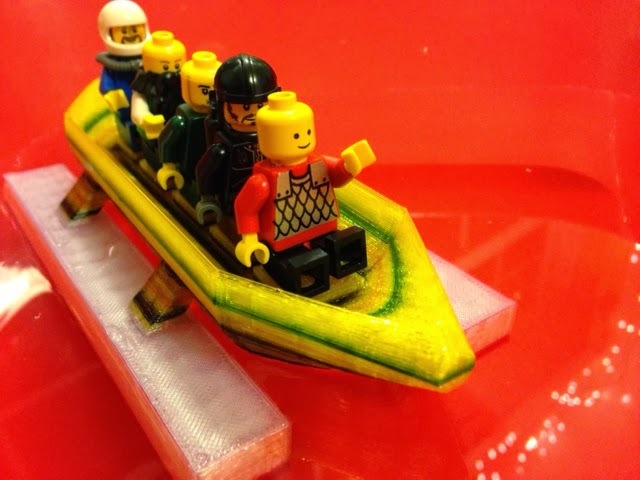 Our son printed his LEGO team's pontoon boat in full size today. Enough room for five minifigs, and it floats! The minifigs sit on LEGO-style bumps to stay in place. The color changes come from filament swaps and drawing on the filament with Sharpie before it went through the extruder. Settings: MakerWare low/.3mm on a Replicator 2 in 3 hours and 10 minutes, plus time for filament swaps.